Kim’s remarks came after Moon met Trump in Washington, where the two agreed that a top-down approach led by the leaders -- one in which a summit preceeds working level talks, rather than the more usual order of working level talks first -- is essential to facilitate further progress in nuclear talks. Trump, for his part, also tweeted Saturday that a third summit with Kim “would be good in that we fully understand where we each stand,” adding that their personal relationship that remains “excellent." “I think the sanctions right now are at a level that’s fair,” Trump said. “We want sanctions to remain in place, and frankly I had the option of significantly increasing them." Analysts said Kim aims to send a message to Washington and Seoul by harnessing the meeting of the Supreme People’s Assembly. 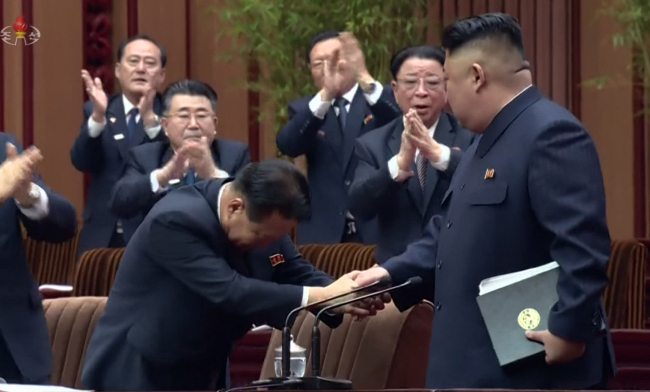 He gave a speech as the top leader of the country, the first time in 29 years -- his grandfather Kim Il-sung did so in 1990.